US actor Al Pacino has received the National Medal of Arts at a White House ceremony that saw 16 other individuals and organisations also honoured. 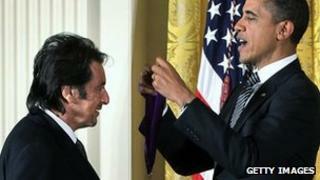 President Obama saluted the 71-year-old's "signature intensity" as he gave the Godfather star the accolade. His fellow honorees on Monday included country singer Mel Tillis and Rita Dove, a former US poet laureate. All of those recognised had left "an indelible mark on American culture," the President said. "We are told we are divided as a people," he continued. "Then suddenly the arts have the power to bring us together." Pacino's many films include Serpico, Dog Day Afternoon and Scent of a Woman, for which he won an Academy Award in 1992. He will soon be seen playing music producer Phil Spector in an HBO film about his trial and conviction for the murder of actress Lana Clarkson.